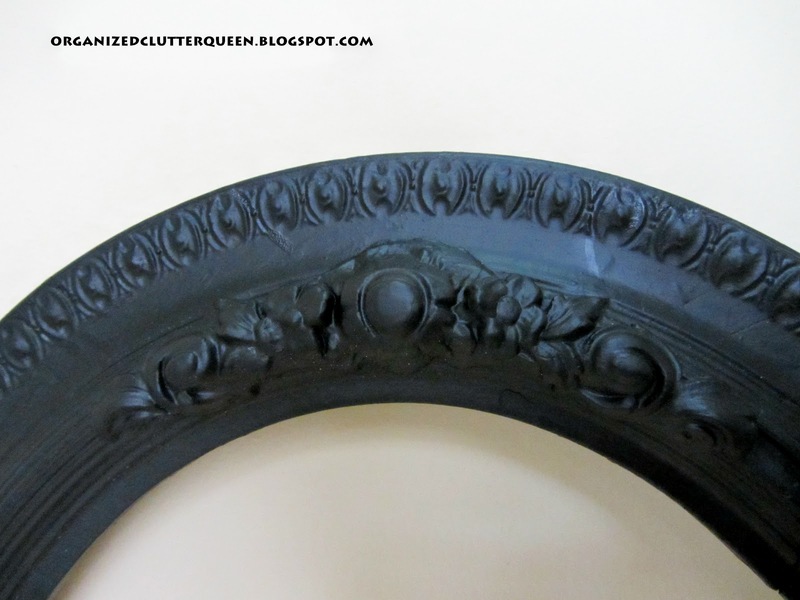 Could you guess from the post title that I am talking about making a chalkboard? I have seen a lot of chalkboards made from frames and mirrors, and lots of other stuff, since I started following blogs. I now have a chalkboard under my belt too! 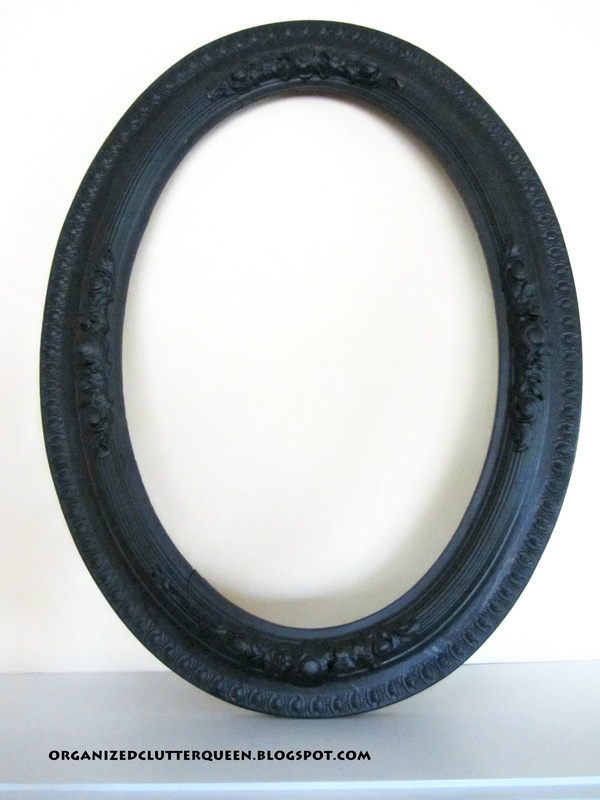 I started with this great frame my mom gave me last week, an antique, wooden, oval frame with plaster decoration. 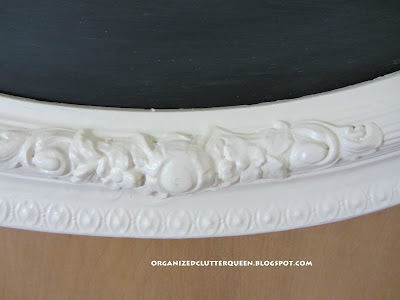 I had a piece of glass cut to fit it, painted the glass with chalkboard paint and painted the frame with Heirloom White. I didn't distress or antique it, yet. I may do that. But for now, I hung it on my living room door. Oh, you and your family will have fun leaving messages and creating art on your new chalkboard. It really dresses up the door! You're gonna squeal when you see the teacup shelf like yours. Great minds think alike! Oh, Carlene, you found a beautiful frame to make into a chalkboard. Oh I love it! I haven't done a chalkboard yet, but I'm with you....I'm going to have to. I did do a pillow, which I also felt was a "have to"!! Oh you did a fabulous job. I love it! I love your chalkboard, Carlene! I haven't thought about making a chalkboard as a blogger's rite of passage, but I guess you're right. I put a chalkboard in our kitchen before I started blogging. But I guess I did it because I retired from teaching, and I missed having a chalkboard! I also saw your post about your new shelf, and it looks really pretty with your blue and white china. Keeute!!! Love it! Thanks for sharing. What a wonderful project, and I loved your post title! You have inspired me, and I am a new follower. What a great job you did! I LOVE it!! Cute little chalkboard, Love the frame! Very very nice! A friend who is a decorator loves chalk board pantry doors. So when I moved into my current home I painted the pantry door with chalk paint. I love it so much I just keep a welcome message on it with chalk marker all the time. So I painted the laundry room door too for a space we can change up with different messages.